In this section of my website I started to present the results of some personal research that I'm doing in my spare time. 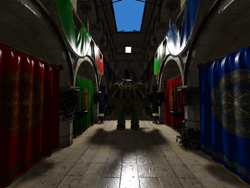 Fully dynamic indirect lighting technique based on a dynamic voxel grid representation of the scene. It is capable of producing visually good and stable results for a high number of dynamic light sources while maintaining high interactive frame-rates. 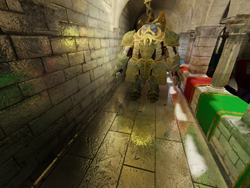 Extension to Rasterized Voxel-based Dynamic Global Illumination technique that produces for a high number of dynamic light sources fully dynamic detailed glossy reflections. 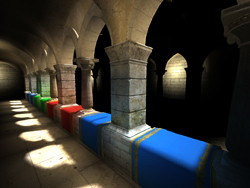 Technique for generating efficiently soft shadows for a high number of dynamic omnidirectional light sources while each light casts individual shadows. 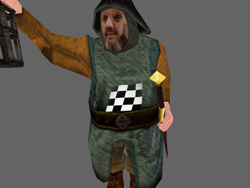 System to dynamically add decals on top of mesh areas that are skinned by multiple bones. In contrast to deferred decals, skinned decals are stretching according to the underlying surface. 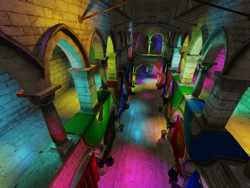 Fast fallback solution to generate shadows for arbitrarily shaped area lights on devices without hardware support for raytracing.